For many communities in the coastal tropics, colorful corals stand as a natural buffer against the daily ebb and flow of the surf and the occasional big storm. But in the age of sea level rise, this steadfast protection may be waning. A study published today in Nature finds that more than half of all coral reefs in the Caribbean and Indian oceans aren’t keep pace with recent rates of sea level rise, and that nearly all of them will fall behind in the future if carbon emissions continue unchecked. While this won’t be a death knell for the reefs per se—rising temperatures are the far greater antagonist—it could be very bad news for low-lying tropical communities, exposing them to higher energy waves that chew up their shorelines even faster. “A lot of that wave breaking [and] wave attenuating takes place on reef crests or flats,” Chris Perry, a geomorphologist at the University of Exeter and lead author on the new study, told Earther. To reach their conclusions, Perry and his co-authors gathered field data on 200 reefs across the Caribbean and Indian oceans, assessing things like reef composition and bio-erosion to estimate each reef’s potential accretion rate (how much higher the reef gets each year). Combining this with satellite-derived measurements of sea level rise from 1993-2010 and model projections of future sea level rise under moderate and high emissions scenarios, the researchers looked at which reefs are “growing up” fast enough to keep pace. The results were not encouraging. Across both oceans, just 45 percent of reefs seem capable of keeping up with recent sea level rise. By the end of the century, very few will. Six percent of Caribbean reefs and three percent of Indian ocean reefs keep pace under a moderate emissions scenario, while under the high emissions scenario, virtually all reefs fall behind the rising tide, with most getting buried under more than half a meter of additional sea level by 2100. It’s worth noting that these levels of sea level rise aren’t going to “drown” reefs, something scientists have witnessed in the geologic past when sea level rise so quickly that corals become starved of sunlight and die en masse. Marine heat waves killed more than half of all corals on the Great Barrier Reef during back-to-back bleaching events in 2016-2017, part of a three year global bleaching event that decimated reefs worldwide. Cobb wasn’t surprised to see rates of accretion failing to keep up with sea level rise. And she noted that the coral data the study used was collected over the last decade, “which already reflects the negative impacts of climate change on global reefs.” Still, she agreed that the study’s implication—of low-lying communities becoming even more vulnerable—warrants further investigation. A key limitation of the work, Perry said, is that it only estimated the maximum potential growth rates of reefs today, a value that didn’t account for how much reef material is lost through physical erosion, or from the breakdown of reefs due to ocean acidification. Plus, these potential growth rates don’t take into account future bleaching-induced mortalities or intense hurricanes, which could shake things up even further. 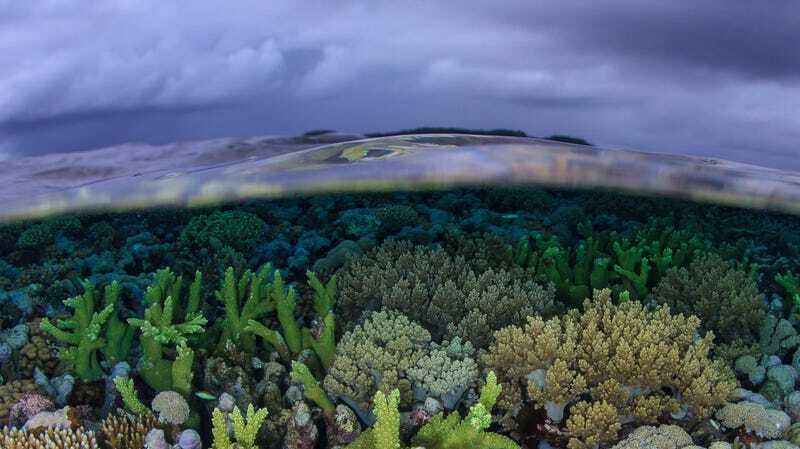 On the other hand, rising sea levels could mean the reefs of the future have more room to grow into, affecting their growth rate in the other direction. “The implications of the study are dire,” Kuffner continued. Indeed. As a separate study published earlier this week found, losing the coastal protection of reefs could cost tropical nations billions in additional flood-related damages after storms.